Fellow gallery43 artists Sabra Esler, Kyle Hicks, and Beth Bush joined me in the discussion in celebration of the METHOD group art exhibition opening. We are all painters but have extremely different styles, subject matter, and studio practices. It was fun to compare and contrast our stories, discover similarities, and find inspiration in the other artists’s techniques. 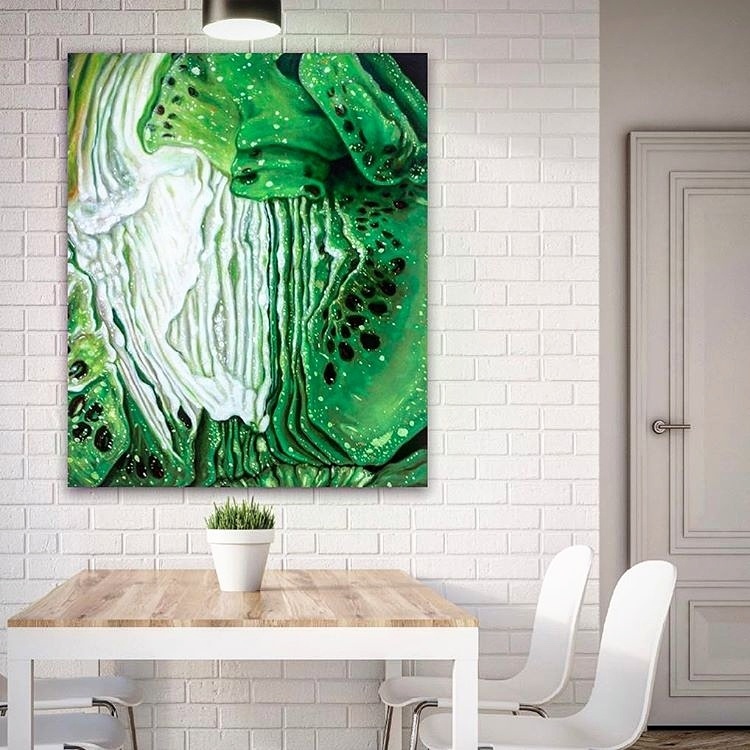 Kiwi I by Angela Faustina, oil on canvas, 30″ by 36”. Available for purchase through Gallery43, Roswell, GA.
Halloween is probably my dad’s favorite day of the year so when I was growing up, my family went all out — decorations, strobe lights, smoke machines, booby traps — the outside and inside of our house was covered. Every year we also carved jack-o-lanterns. The first step is cutting the top off the pumpkin and removing the pumpkin guts. My dad usually used his hands and an early memory of mine involved me wanting to help out with this process. The pumpkins were small so once my hand was inside the pumpkin, I couldn’t see what I was touching. I didn’t like that feeling but I finally just went for it. I pulling up that first orange handful of dripping, gooey seeds and stringy pulp and squeezing it between my fingers. I knew what I was seeing and where it came from but seeing it out of context was weird – it looked like it could have come from inside my body or like I pulled it up off the ocean floor, like it wasn’t really meant to see the light of day but was too fascinating to put back. And that color! I wanted to carry on the jack-o-lantern tradition when I went away to college so one year Dave, my significant other, and I went to a pumpkin patch and picked out the biggest one we could afford. I was really excited when we got it home; it is still the largest pumpkin I have ever carved. I cut the top off the pumpkin, peered inside, and was blown away by what I could finally see: layers upon layers of viscous fibrous membrane and slimy seeds. It looked like colorful alien spiderwebs, without a discernable pattern. It was also different from the handfuls of pulp I was I used to; color inside the pumpkin seemed to darken between layers and the color temperature shifted where daylight was reflected into the pumpkin. It looked like it felt in that early memory – weird but intriguing, alien yet familiar simultaneously. I grabbed my camera and a macro lens – that was the first pumpkin I could safely stick it into – and that was the start of a photography project. I photographed the insides of familiar fruits, and then researched and found tropical, foreign fruits that I had never heard of before. I tore open fruit that was under ripe, perfect for eating, and decaying. I actually started photographing the inside of everything- stairwells, garbage cans, cans and boxes of food- but the color, dimensionality, and organic otherness of ripe fruit was the only thing that held my interest. 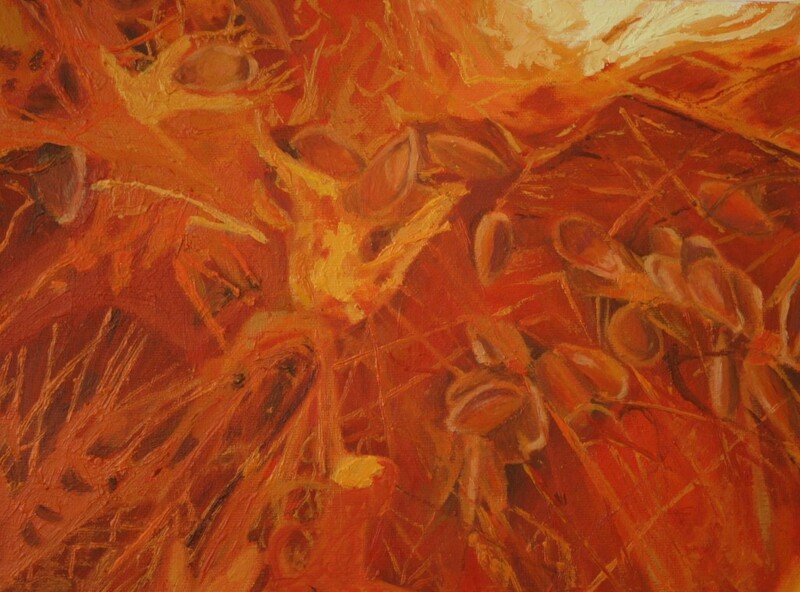 The first painting I ever made of the inside of fruit: Angela Faustina, Pumpkin (14), 2007. Oil on canvas, 12” by 9″. As I got deeper into my new obsession I became unhappy with my photographs. Photography is a great way to capture things but it can flatten the picture plane and distort the image. At this same time I was really enjoying creating still lifes in oil paint. As an experiment, I combined the two passions into a photorealistic painting of that giant pumpkin. I fell in love. Layers of oil paint mimicked the layers of the pumpkin in ways photography did not. If you’re not familiar with it, oil painting is traditionally done in lots and lots of layers. Light travels through the transparent or semi transparent layers, hits the canvas and bounces back towards the viewer, which makes it look illuminated. Generally, fruit pulp is mostly water so it interacts with light in a very similar way. I could also easily manipulate the image in oil paint, fix or heighten image distortions and create depth. I have continued this body of work for over a decade. I have to thank gallery43 again for putting together such an interesting event and letting me be part of it. 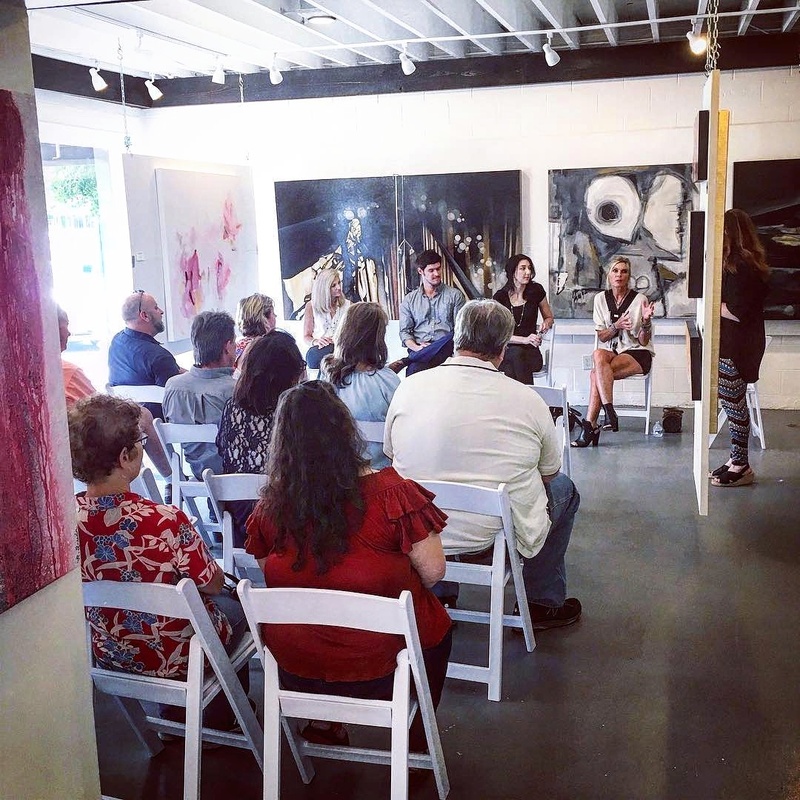 I had a blast speaking with other artists and art lovers! My studio practice is pretty quiet and solitary so it was wonderful to be part of a literal conversation about local contemporary art. I’m grateful for their support and extremely happy to be a gallery43 artist. 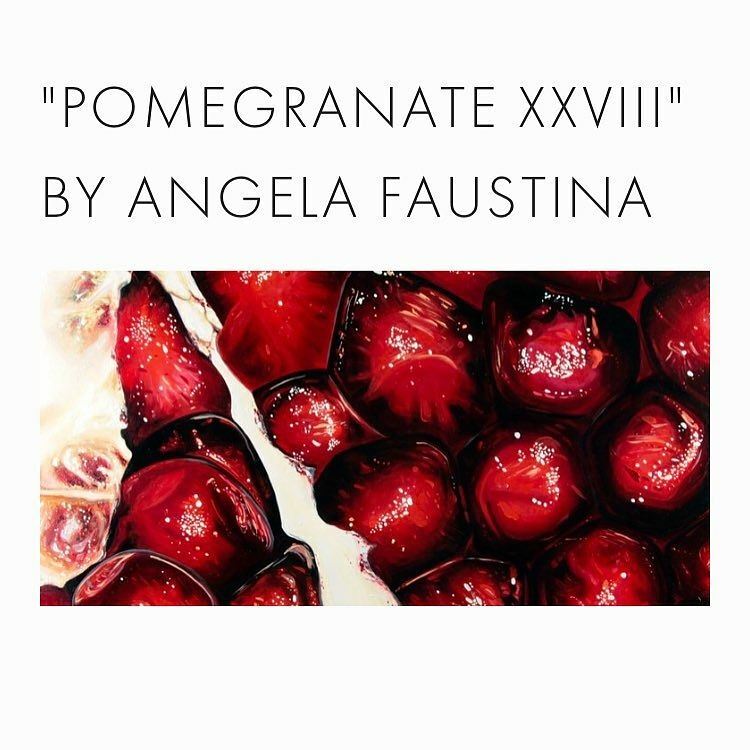 Angela Faustina, Pomegranate XVIII, 2016. Oil on cradled painting panel, 24″ by 12″. Private Collection.